Bluehost and 000webhost are two popular web hosting companies. As many customers hesitate between the two, we will compare them using these different criteria: performance, pricing, features, security, usability, and customer service. This Bluehost vs 000webhost comparison will help you make an informed decision about which hosting company is right for you. Bluehost has many different types of web hosting plans, from shared hosting to VPS to dedicated servers. They even offer reseller accounts. Bluehost is great for any type of website or business, no matter how big or small. 000webhost is a different type of host. They offer shared hosting only, so they are best suited for small to medium blogs or businesses. Uptime is important to any website. Bluehost has a track record of about 99.93% uptime every month, while 000webhost has an average of 99.86%. 000webhost is also slower than Bluehost. Page load speeds with 000webhost are 3.44 seconds, while Bluehost averages at 1.42 seconds, making Bluehost the clear winner. If you are just starting out, and have no budget for your web hosting services, 000webhost has what you are looking for. Free web hosting is what they focus on. Once you expand beyond their free hosting limits, you can upgrade to their premium or business plan for unlimited resources. Bluehost has unlimited scalability. Their prices also start at almost nothing, but will multiply once your promotional period is over. As far as pricing goes, you can’t beat free. 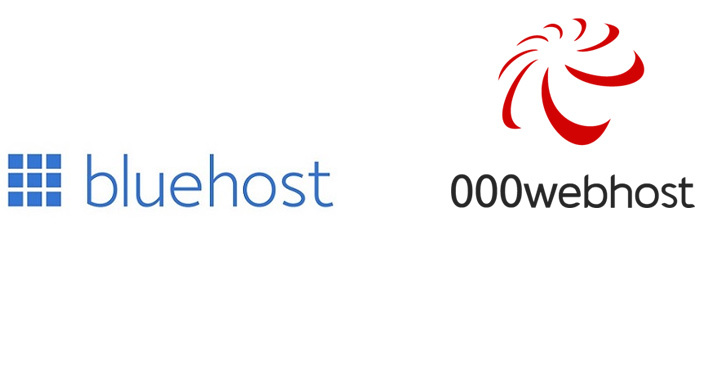 However, Bluehost wins over 000webhost based on features alone. 000webhost has the most basic security. When a website isn’t well known, this isn’t a big problem, so their free web hosting plan only offers the bare minimum security features such as spam filters, IP deny managers, and free backups. Their premium and business plans offer DDoS protection, a free SSL certificate, and free antivirus scanning. Bluehost offers all of this at their lowest level, which means they come out ahead in security. Both of these web hosting services offer good user-friendly options. They have a website builder with themes, and a do-it-yourself drag-and-drop feature. Bluehost and 000webhost also give their customers access to the cPanel control panel. One thing that Bluehost does better is they offer one auto-install application marketplace for all of their clients. Free customers of 000webhost only get about 10 scripts that they can auto install. You must purchase a plan to get access to over 300 scripts that they offer. Bluehost and 000webhost have a 30-day money back guarantee on all their paid services, as well as 24/7/365 customer support. Bluehost’s support team can be contacted via support ticket, phone, or chat. According to customer reviews, the wait times can be around 45 minutes. 000webhost can be contacted via their ticket system or live chat. Unfortunately, their reviews online are all over the place. Some customers are very happy with them, while others were very frustrated. We consider that both web hosting companies perform equally in the customer service. If you really have no budget for web hosting, free, slow websites are better than nothing. However, if you’re looking to get off to a great start, and can afford a little bit on hosting, Bluehost is the best choice here. Even the cheapest plan at Bluehost has better security, and more user-friendly features than 000webhost. Do you have questions or comments about this Bluehost vs 000webhost comparison? Please share below in the comments section. We would love to hear from you!